I fell in love with Southwest and Western designs at an early age so I couldn’t help but learn the skills in creating them. Many of my designs are created using Navajo handmade metal stamps which preserve designs created 100 years ago. 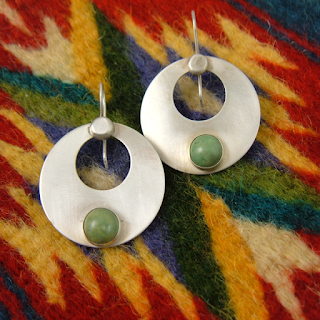 When creating pieces for my American West Jewelry Collection, I allow my energy to flow through the metal stamps I use. Stamping into metal becomes a rhythm, a dance of the stamps, a flow and feeling, sometimes absolutely perfect, some not, which adds the handmade quality and individuality of the piece. Southwestern, Western, and Native American jewelry designs have been popular forever. The styles are loved because generally, they haven’t changed much over time; the designs are here to stay. 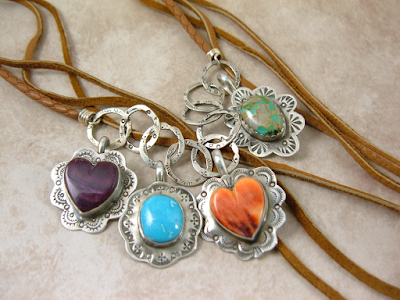 A pendant, bracelet or necklace pieces are being layered with bohemian jewelry such as ribbons, leathers, feathers, pearls and even crystals to create a special, comfortable, and free spirit looks. Dress them up or down, with that perfect black dress, tee shirts or a white blouse and jeans. Think about everything you have that would be enhanced with that perfect jewelry piece. 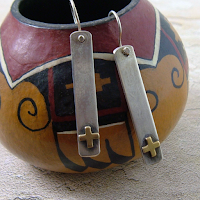 Others wear these designs because they have a specific symbol or belief in them. I’m hoping when you wear anything from my American West Collection it is your fashion accent be it classic, vintage, your statement piece or just for fun, you’ll feel wonderful wearing it. I created the American West collection of bracelets, pendants, necklaces, and earrings to include many cultural expressions of life which adds Native American, Southwest and Western inspired designs. Each brings together the past with the present and invokes the remembrance of the American West. Nothing I make is mass produced, each is individually created by hand in my studio by me. No two pieces will ever be the same. Being 100% handmade they may have minor imperfections which add to the charm of being handcrafted. 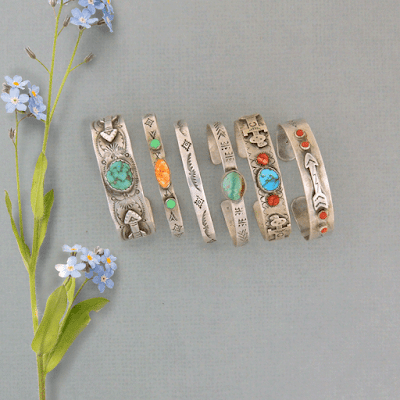 Please enjoy and like my The American West jewelry collection. I’d love to create something especially for you. If you’d like help in picking something out for yourself or as a gift I’ll be happy to help. Anarchy, a word which to many means different things to so many. For some, it means no enforced law or government and freedom without force. To others, it means a society of individuals who enjoy and live in complete freedom without government. With today being influenced by the TV series Sons of Anarchy a lot of people believe it means the absence of most cohesive principal; such as a common standard or purpose. SOA (Sons of Anarchy) aired originally in September of 2008. The last season of Sons of Anarchy starts September 9, 2014, on the FX cable network station. SAMCRO which is not a name but stands for Sons of Anarchy Motorcycle Club Redwood Original is on its last season. 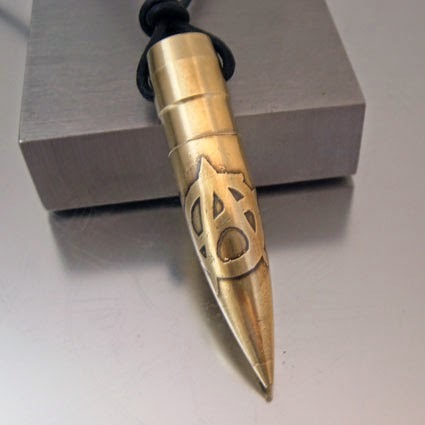 If you're a watcher of Son's, love Jax, Gemma, and all the characters of the Son's, then you need to own a Sons of Anarchy necklace originally designed by me, Julie Teeples. I'm offering various caliber sizes of the Anarchy design. Visit my site to pick your bullet necklace in the caliber you'd like, there are sizes for men and women. You can even request a custom design for your Son's of Anarchy jewelry. In 1994 Labatt Breweries of Canada teamed up with Harley Davidson Motorcycles in a promotion to give away five Harley Davidson XLH Sportster 883 Motorcycles. A collection of 10 Harley Davidson beer bottle crowns (also referred to as caps) were designed, each having a different Harley motorcycle on them. These 10 became the 1994 Labatt Harley Davidson crown collection. The Harleys included on the caps for 1994 were; Dyan Low Rider - Dyna Low Rider Conv - Fat Boy - Heritage Softail Classic - Heritage Softail Special - Road King - Softail Custom - Springer Softail - Ultra Classic Electra Glide - XHL Sportster 883. 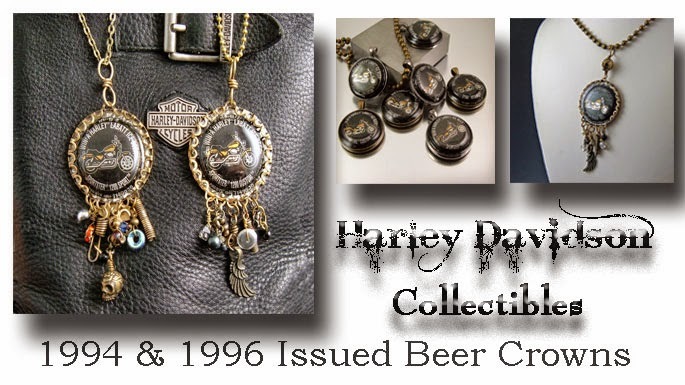 In 1996 Labatt and Harley did it again and a new collection of crows was released. The collection contained 6 of the original 10 designs of 1994 plus 6 newly designed caps making the 1996 collection a total of 12 caps. The Labatt Harley Davidson 1996 crown collection consisted of the following designs; Road King - Fat Boy - Softail Custom - Springer Softail - Heritage Softail Classic - Ultra Classic Electra Glide - Dyna super Glide - Dyna Wide Glide - Sportster 883 - Sportster 1200 Custom - Sportster 1200 Sport and the Electra Glide Classic. I was luck to find some rouge beer caps from both 1994 and 1996. These caps are from broken sets of both years. I've made unique, one-of-a-kind, upscale necklaces and accessories from these caps. I'll be releasing my designs on April 5, 2014. You may contact me for availability of particular Harley designs or to reserve your piece. These jewelry pieces make wonderful gifts for anyone who loves HD. Once they are sold, they are gone forever. 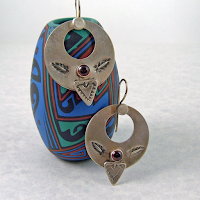 These are original jewelry designs offered exclusively at OakCityGallery.com . Pantone sets the color palette for artists and designers worldwide. Many people shop for fashion, accessories, cars, and home décor based on the yearly color palette predictions and suggestions made by Pantone. We must agree color is a part of our daily lives; it has the ability to engage the eye, create an atmosphere, and provide us with the feeling of joy, excitement, and energy. As an artist and jewelry designer, I must be aware of color predictions each year along with any season color changes as well. Truthfully I admit I tend to stay with a safe or neutral color palette in most of my jewelry designs. Why? Because the neutral colors will always be there, everyone tends to love them, and they play well with most all the other colors out there. Both 2014 Spring and Fall color palettes use several neutral colors; Aluminum, Cognac, Cypress, and Sand. You can see how well they look against most all other colors. Using my jewelry as color is a great way to accent your wardrobe. If you're a person who loves wearing beautiful, bright and bold color clothing, a jewelry piece accented with neutral color may provide just the right amount of balance or completion to your outfit. If you're a person who tends to wear neutral or darker colors, a bit of color in a necklace or bracelet may do the trick to finish off your look without being "too" colorful. Don't be afraid to mix several different pieces of jewelry together, a strand of old pearls with beautiful brass or copper chains and pendants. Maybe a set of assorted beads accented with a simple chain and bullet necklace pendant. A strand of pearls with a strand of crystals, and don't forget doing the same with your bracelets as well...I think you get the idea. Have fun with the jewelry you wear. Visit www.OakCityGallery.com for an assortment of beautiful jewelry pieces to add to your collection. Enjoy and let the jewelry you wear bring a smile to your face. 9-11 will live in our minds, hearts and soul forever. On September 11, 2001 four airliners where hijacked, destine for suicide attacks against the United States. Two planes were flown into the World Trade Center in New York. Another plane was sent crashing into the Pentagon outside of Washington. The last plane crashed into a field in Pennsylvania. Over 3,000 people died during the attack in New York, that number doesn't include the hundreds of firefighters, paramedics, police officers and first responders who also lost their lives. Over 125 civilians and military personnel lost their lives at the Pentagon. To that number include the 64 people on Flight 77 which crashed into the building. All 45 people on board Flight 93 lost their lives when the plane crashed into a rural area in Pennsylvania. We will never know what plans the terrorist had for that flight. 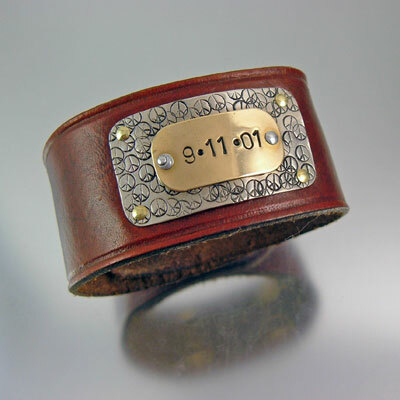 This leather cuff bracelet is in memory of everyone and everything which happened on Tuesday, September 11th, 2001. Wear in memory; wear it as a proud American. Will fit 7-1/4" to 8-1/2"
There is only ONE of these bracelets. Be the first and proud owner of this one of a kind 9-11 bracelet by visiting My 9-11 Bracelet before its gone forever. This is an original concept design made artist Julie Teeples. The images, idea and concept is intellectual property and is protected by copyright law. JT is my branding logo. JT are my initials; Julie Teeples. When customers receive their order they will see JT on either the jewelry card or jewelry tag. JT is my logo and has been used since 2006, please don't confuse this logo with other JT logos you may have seen. Oak City Gallery or JulieTeeples.com are the websites where you've purchased jewelry made by me.